I recently read an article written by William J. Bennett who monitors the list of University commencement speakers each year. He is reviewing the trend on the chosen speakers and the message of these speakers. It is a terrific idea Mr. Bennett has here as it can tell us so much about where society stands (at least here in the United States). The article focused on what he calls, “one of the most original choices” for a commencement speaker. 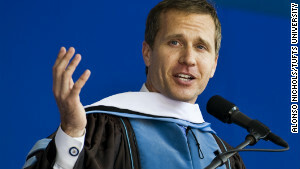 The speaker in question is US Navy SEAL Eric Greitens who spoke at Tufts University this year. Eric is indeed a Navy SEAL and a Rhodes scholar and humanitarian. His message as presented in Mr. Bennett’s article spoke to me and my mission with this blog. Eric through his actions is We Move Together personified. Let me explain through Eric’s own commentary during the commencement speech. Challenging the new graduates is a standard approach at commencement ceremonies. Eric follows along to challenge, but his message is different. Typically the speaker tells students to “follow your passion” or “dream big”. As Mr. Bennett points out in the article, higher education has turned from “selflessness to self-obsession”. Eric’ message concerns “sacrifice, to serve one’s country and to live magnanimously”. He calls for the students to “think above and beyond their own dreams and desires … to serve a purpose larger than myself”. Eric recognizes the higher order of leadership … of Servant Leadership. It is not about me. It is about you and us. We Move Together. It is Memorial Day weekend here in the United States. It is a time for us to reflect on and thank the men and women who serve our country through the military both past and present. I for one will do just that this weekend including reading more about Eric Greitens, a man who personifies WeMoveTogether. Great post. Have a great weekend Michael. Thanks David – I have started to read Eric’s book this weekend. i will report out on how I like it later. Have a great weekend yourself. Brilliant words from Eric here. I think we often forget that Servant Leadership means putting the dreams and aspirations of others before your own as well. Challenging! Thanks Curtis. I am halfway through Eric’s book and powerful stuff. All the best to you.